I can sum up my day so far in one word: lazy. Let me just say I am loving this lazy-nothing-to-do-but-get-caught-up-on-my-DVR- day. While I was flipping through the channels, I stopped on LMN (Lifetime Movie Network). I love LMN! I must admit I can sit and watch those Lifetime movies for days. Well, most of then anyhow! I am partial to the romance ones. 🙂 A movie called View of Terror, staring Shannen Dougherty just happened to be on today. Um, what? I grew up in Ohio and I never milked a cow or played softball. I lived in the city and played tennis. LOL It’s always amusing to me that Ohio is the go to state for farm living in movies and on television. Anyone remember the Grey’s Anatomy episode called “Sanctuary”? It was in season 6 when a shooter was loose in the hospital. 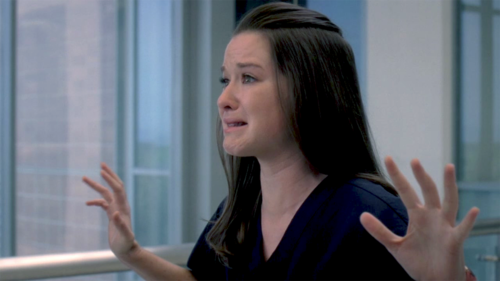 April: My name…my name is April Kepner. I’m 28 years old, and I was born on April 23 in, in Ohio. I’m from C-Columbus. Columbus, Ohio. Um, my mom, my mom is a teacher, and m-my dad is a farmer. Corn. C-corn. He, he, he grows corn. Their, their names are Karen and Joe. I have three sisters! Libby’s the oldest. I, I’m next, and then there’s K-Kimmy and Alice. I, I, I haven’t done anything yet. I haven’t…I’ve barely lived! I, I’m not finished yet. No one’s loved me yet. Please. Please. I’m someone’s child! I’m a person! I’m a person! J and I always joke about how Ohio is everywhere! It seems like television and movie writers love to use Ohio. From now on, I am going to share the Ohio love with all of you! I decided to start a little feature here on the blog where you can find an ongoing list of all the times Ohio was mentioned in movies, books, television shows, ect. Feel free to send me an email (SugarSpiceDaisies@gmail.com )and I’ll add it to the list if it isn’t in there already. It should be fun! This entry was posted in movies, Ohio, tv and tagged Akron, columbus, farmer, Grey's anatomy, Lifetime, Lifetime Movie, LMN, Ohio, Prison Break, Sactuary, sarah drew, Shannen Dougherty, St Thomas Hospital, Summa, television by Lauren. Bookmark the permalink. No we’re not all farmers. Goodness. LOL I remember one time when I went to Vegas (8 years ago, maybe?) people asked where I was from and I said “Akron, OH” and they just kinda gave me blank stares and I then I said “It’s near Cleveland” and they would go “Oh! Drew Carey!” His show was really popuar then! haha.